Share only what you want with our new customizable Report Builder! We know that the work of managing the performance athletes and teams is itself a team effort. What you need to discuss with your fellow coaches, trainers, medical staff and sports scientists changes from day to day and meeting to meeting. We heard from you that being able to customize the right information for you can enable you to focus on what matters most. Today we are pleased to announce that we have updated our Report Builder to make it customizable and more powerful for you. This way, you get to choose what appears on your report putting the control in your hands. The default is to INCLUDE all sections. If there are sections that you do not want to include simply click the blue check mark box. This tells us that you don’t want to see this information in your printable report. Once you have proceeded through 3 screens of options, click Finish. If you select only 1 athlete to be included in your Team Dashboard, this becomes your Athlete Report! 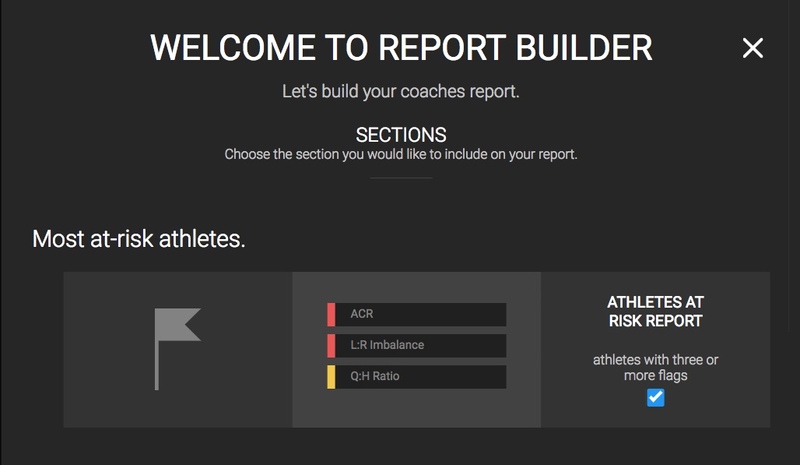 You can share this with your athletes or anyone who regularly needs Athos reports.